Better Ingredients? Better People: An open letter to John Schnatter and Everyone I Know. | "…but I'm not the only one…"
Better Ingredients? Better People: An open letter to John Schnatter and Everyone I Know. So a rich guy has a big house. Not a newsflash. As a liberal, I’d like for the vitriol to NOT be coming from us. As a human, the idea of someone having a catastrophic health event, and no coverage, is unthinkable. 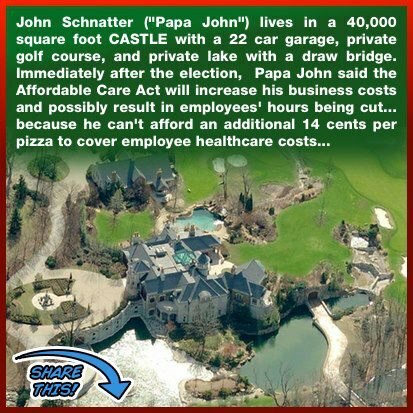 As a person of some intelligence, I get that Obamacare may well cost businesses a little extra, and I don’t think it’s ridiculous to pay 14 extra cents for a pizza to help a whole lot of people keep their jobs, their hours, and have health coverage. Everyone’s screaming about people paying their ‘fair share.’ Our President says that we are the ones that will make the change. He means all of us. I was a victim of an unscrupulous sub-prime loan broker and my struggle to keep my home, and for many years, to keep my kid clothed and fed, is fodder for another post. Suffice to say that good old Papa John, with his easily find-able 25% off promo codes, was a hero more than once. A $9.59 large pizza? Four meals. Price change to $9.73? Even I can handle that. Papa, will every one of those 14 pennies go to healthcare coverage for your employees? Will every single one of those pennies insure every single one of your 16,000-plus workers? Then do it. Raise the price and don’t slap the employees who helped you ‘build that’ in the face. Care about them enough to give them care. You’re a hero to no one by threatening to fire people and cut hours so you can pay instead, thinking then the healthcare law won’t apply to you. Be a leader and take care of your employees. Petulance isn’t attractive and it doesn’t sell pies. If you decide to do this, I’m in. I will make Change with a little change. Look, in order for all of this to fall into place, everybody’s got to pitch in, not just the guys with houses like the one in the pic (is that a moat?). It IS going to cost businesses, small and large, extra to comply with the requirements, and in order to even STAY in business, some will have to pass part of that cost to consumers. Some businesses will try to cry “Obamacare!” and price-gauge, no doubt. My guess is they will be outed pretty quickly. I do not agree with pretty much anything Papa stands for politically. I also don’t think 14 cents looks like a fleecing. And I would still buy the occasional pizza. So. To John Schnatter: Is it worth the well-being of your employees and the goodwill of consumers to accept what is, and behave accordingly? You’ve done a good business, and congrats on the castle–I won’t begrudge you your real estate. Are you going to do what’s right for your people? So. To Everyone I Know: What do you think would make people boycott PJ’s more: him firing employees and cutting hours so he can bypass Healthcare requirements, OR raising the price of a pizza 14 cents? If he had just bitten the bullet and charged the extra pennies in order to cover his employees without saying anything, would you even have noticed? If Papa John decides to keep his employees on their current schedules, would 14 cents be too much to pay to help 16,000 people? Yes, I realize that if EVERYTHING in America suddenly costs 14 more cents the world will end, the terrorists will win, and the (insert Armageddon of your choice here, we are an equal-paranoiac-opportunity blog) will crash down upon us. I don’t pretend to understand economics, and if you post an econ lesson in the comment, I will really try to read it through, but I live in the right brain and my eyes will probably glaze over or close completely. But if I’m just way off base here, educate me. It just seems like we all need to face a change or two in order to make things work in our country, and helping people keep their jobs and businesses is a good place to start, and I’m okay with that. But I thought I’d just start with a pizza. What do you think? I feel like I’d pay the 14 cents. You hear me, Papa?